Conveyor oven refers to a type of oven which moves products through a heated stack. Conveyor ovens are becoming popular in food industry due its efficient and time saving benefits. Apart from food industry, conveyor ovens are also being used in a several industries such as automotive, manufacturing, sporting goods and other industries. Global conveyor ovens market is expected to grow at a CAGR of 3.5% during the forecast period i.e. 2017-2024. The market is expected to account for USD 116.2 Million by the end of 2024 from USD 86.4 Million in 2016. This growth can be attributed to the increasing consumption and demand for baked foods such as pizza and others across the globe. Moreover, various food companies are adopting advanced food preparation equipment to improve customer service. This factor is widening the demand for conveyor ovens. Geographically, North America is anticipated to dominate the overall market of conveyor ovens during the forecast period. Further, North America conveyor ovens market is likely to grow at a significant pace owing to the rising demand for fast and baked foods. Likewise, Europe conveyor ovens market is expected to witness substantial growth over the forecast period. Growing reliance on modern commercial kitchen tools is likely to spur the demand for conveyor ovens in the Europe region over the forecast period i.e. 2017-2024. Further, Asia Pacific region is expected to be the fastest growing market across the globe. The market of Asia Pacific region is mainly expanding on the back of the expansion of food chains in the region. Moreover, as of 2015, the number of KFC and Pizza hut outlets was estimated to be 4800 and 1300 respectively. Further, as per a press release, Yum! China, the parent organization of KFC and Pizza hut, announced that is planning to open 20,000 restaurants in China by 2020, which is likely to stimulate the growth of conveyor ovens market during the forecast period. Growing demand for baked food products is anticipated to be the dynamic factor behind the rapid growth of conveyor ovens market. Moreover, increasing acceptance of modern cooking practices in restaurants is substantially raising the demand for conveyor ovens in various food industries and restaurants. On the other hand, rapid urbanization coupled with changing lifestyle is further expected to spur the growth of conveyor ovens market in developing regions. Additionally, growth of restaurants market is swelling the demand for the conveyor ovens market. These conveyor ovens help the restaurants to prepare substantial amount of food in less time. Wide scale application of conveyor ovens in various end use industries such as automotive, manufacturing and sporting goods industry is further opening a gateway of opportunities for the growth of the global conveyor oven market. 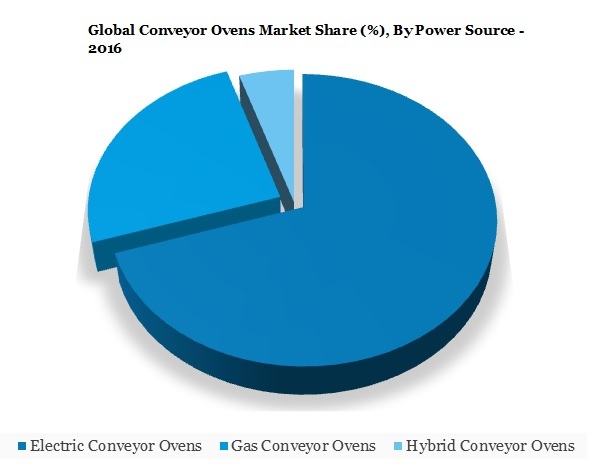 In addition to this, strong growth of automotive industry in developing nations such as China and India is anticipated to positively impact the growth of the conveyor ovens market in the upcoming years. However, availability of other ovens such as deck ovens is the major restraining factor for the growth of this market. Moreover, rising adoption of used conveyor ovens among small food service providers is also hampering the demand of conveyor ovens.